GEORGE TOWN: Tropicana Ivory Sdn Bhd's (TISB) RM10bil Penang World City (PWC) project in Bayan Mutiara will have affordably priced high-rise units and a world culture' component, featuring different cultural residential enclaves. TISB is a joint-venture company in which Dijaya Corporation Bhd holds a 55% stake, while Ivory Properties Group Bhd the remaining 45%. Ivory group chairman and chief executive officer Datuk Low Eng Hock says about 15% of the properties for the 800 to 1,000 high-rise units for the first phase will be priced between RM300,000 and RM500,000, depending on the built-up area which ranged between 600 sq ft and 800 sq ft. The first phase, to be located on a 10-acre site and scheduled for launch in the third quarter of 2012, will have a gross development value (GDV) of around RM600mil to RM700mil. Subsequent phases for PWC will also see 15% of the properties priced in the affordable range of between RM300,000 and RM500,000, Low adds. Low said the group might consider using the plot ratio guidelines introduced in 2010 for the island to build medium-priced properties. Under the revised guidelines of 2010, developers have to allocate 5% of the total units in a development scheme to be priced at RM200,000, 10% to be priced at RM300,000, and another 5% not exceeding RM500,000. The affordable components were in the planning of the entire master plan as a value-added component from the very early stage, even during the tender exercise, according to Low. “As we are planning for a world class city within World City, economies of scale is of the essence. 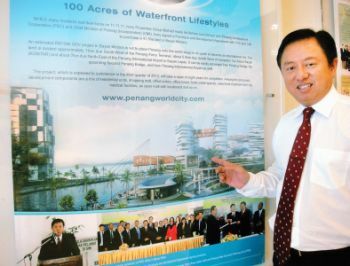 “In order for this to happen, we need a huge number of Penangites to call World City their home. On the world culture' component in PWC, Low says there will be residential enclaves where the properties will reflect the architectural and cultural themes of a particular country. “For example, we will create Chinese, Korean, Middle Eastern and European villages in PWC, so that the properties can be marketed in that particular country through an appointed real estate agent. “We want to create a world culture to attract tourism and foreign investors and to differentiate PWC from the other mega-development projects on the island. “These parcels will be solely for en-bloc sales to expatriates,” he says. On the impact of the global slowdown on PWC, Low says at present the group has not felt the impact of the global slowdown yet, at least not in the financial and real estate sectors. “Our banks are well positioned and the central bank played a very proactive role to mitigate any possible impact or threat to our economy. The scale of foreign direct investments is very encouraging not only for Penang but for Malaysia as a whole,” he says, adding that the group does not foresee any slowdown in the next two to three years. “In fact, property prices in Penang are still very attractive and have yet to reach its peak. Many magazines, including those from Hong Kong, have been mentioning and promoting Penang as the ideal home destination. “Investors from China, Japan and Korea, for instance, are very much interested in coming to Penang, particularly in the aftermath of the Japan earthquake and tsunami,” he notes. Meanwhile, on Ivory's plans for 2012, Low says the company is targeting to launch projects worth approximately RM1.4bil in GDV this year, including The Latitude in Mount Erskine, Penang Times Square phase three and phase four, City Mall and City Residence in Tanjung Tokong. “The company is targeting to rake in sales of some RM800mil this year. “Last year, we only booked RM121.8mil of sales for completed and on-going projects besides having unbilled sales of RM227mil to be realised over these two years. We are expecting higher sales this year since we have more projects to offer this time and not forgetting the much anticipated PWC project,” he adds. Last July, Ivory won the right to purchase and develop the site in Bayan Mutiara after edging out four other parties, including SP Setia Bhd, which were bidding for the land. Ivory won the bid after offering the highest price to buy the land for RM240 per sq ft or RM1.072bil for the entire site, securing with it the right to develop on the existing 67.56-acre site and another 35 acres that will be reclaimed over the next three years. To date, about RM22mil or 2% had been paid as earnest deposit for the land. The remaining downpayment of RM80mil will have to be paid on or before April 10. In the agreement with Dijaya Corporation Bhd, Ivory is the turnkey builder for PWC and will thus be entitled to 48% of the project's gross revenue with the amount due to the company estimated at RM5bil.